Both locations of Park & Sixth will be closed Saturday - Monday. Thirty Acres is open this weekend with normal hours, but will be closed on Monday. Zeppelin Hall will be holding a special Labor Day Weekend event they're calling Steak Haus. $21 gets you 1 lb of the grilled meat of your choice, a sauce, and a side. It runs Saturday - Monday. This Thursday, Trolley Car Bar & Grill is having a Karaoke night! It's being hosted by Freddie Robinson from VH1 and will run from 8pm-10pm. Drinks, music, outdoor space....sounds like a great night! Today's vendor is Stony Hill Farms who can be found at various markets all around Jersey City and throughout New Jersey! Thanks for participating Dana and everyone at Stony Hill! Stony Hill is family owned and operated farm. The business started out in 1988 as a florist specializing in cut orchids and has expanded to now include fruits, vegetables, beef, eggs, farmers' markets, a corn maze, pick your own, and new in 2012, a CSA program. We have two home stores located in Chester, NJ. Our farm market is open May through December, and our Greenhouse is open year round. 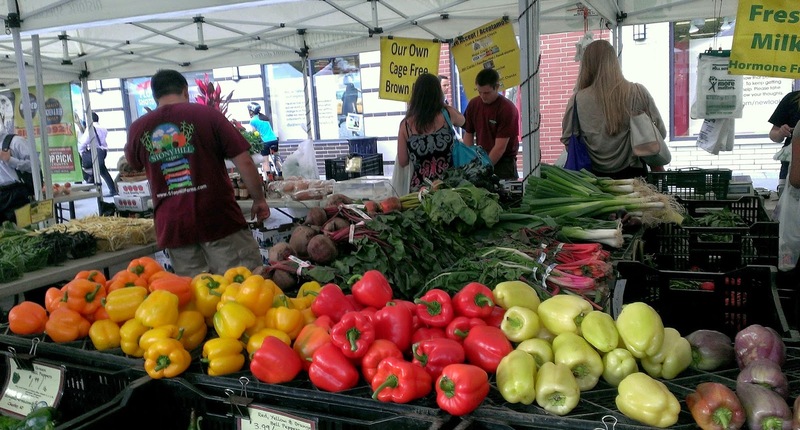 We also attend 14 weekly farmers markets April through December. 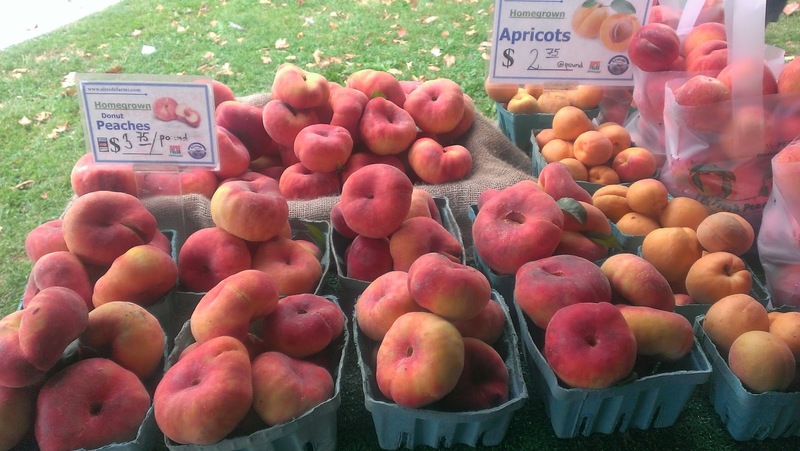 We participate in the Historic Downtown Jersey City Farmers' Market on Mondays and Thursdays, Hamilton Park on Wednesdays, Journal Square on Fridays, Paulus Hook on Saturdays, and Riverview Fisk Park on Sundays. 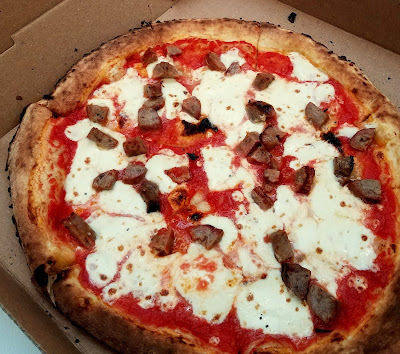 Outside of Jersey City, we are in Maplewood on Mondays, Riverdale on Tuesdays, South Orange and New Providence on Wednesdays, Hoboken on Thursdays and Saturdays, and Chester on Sundays. Roman Nose reopens tonight after being closed all last week for vacation and they have a ton of specials to welcome everyone back with! They'll be running their nightly "Ora Felice" happy hour specials until 6pm with $4 draft beers, $6 house wines and $8 cocktails. 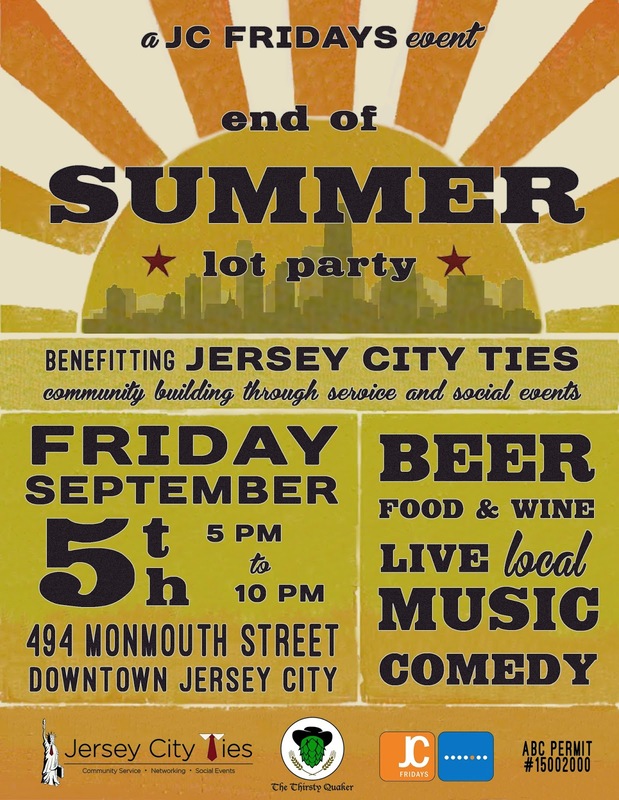 Next Friday, September 5th, Jersey City Ties & The Thirsty Quaker are presenting a special evening of live, local music & comedy as part of JC Fridays. There's quite a line-up and it will be running from 5pm until 10pm at 494 Monmouth Street. Jersey City Ties, a local group for young professionals that aims to build community and support philanthropic endeavors, will be selling beer and wine to benefit their organization and The Lamp Post Bar & Grille will be selling food. Outer Limits Hot Sauce (found at 6th Borough Market) is running a recipe contest. Submit your favorite recipe using their hot sauce and you could win a three pack of hot sauce and an outer limits t-shirt. The Jersey City Chapter of UNICO is now selling tickets to their pig roast in September. In sad news, it appears Goehrig's Bakery in Jersey City Heights has closed down. The Sparta, NJ location closed earlier this summer. This Friday, join Barcade as they host Sierra Nevada Beer Night, beginning at noon and continuing all night. 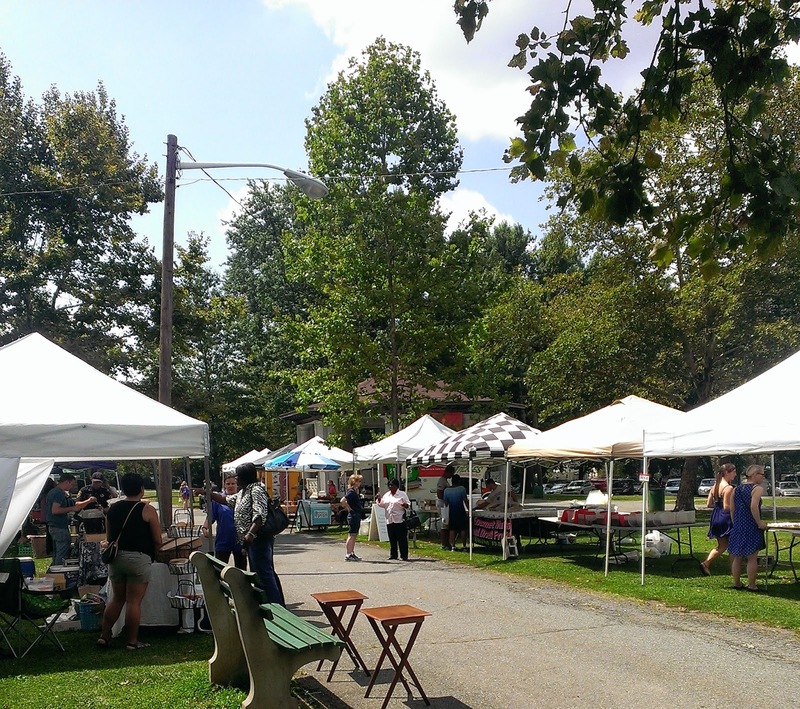 Last week, I went to Lincoln Park to visit the Farmers' Market that started up this year. Lincoln Park is one of my favorite areas of Jersey City and the Farmers' Market is just one more (excellent) reason why. It's a relatively small market that usually has about 14 vendors, but it's busy and there's a pretty wide variety in what they offer. There wasn't a stand I walked by that I didn't want to pick up something. Beginning today, Friday 8/22, Milk Sugar Love will be extending their hours and will be open in the mornings to help you get your day started right. On the weekdays, the store will open at 8am and on weekends, they'll be open beginning at 9am. They will have pastries and coffee available. Welcome to Meet the Vendor, a new series on Jersey City Eats that will profile different vendors from all the Farmers' Markets around Jersey City. We have a wonderful and constantly growing market scene in Jersey City with unique, dedicated vendors and I encourage everyone to take advantage. 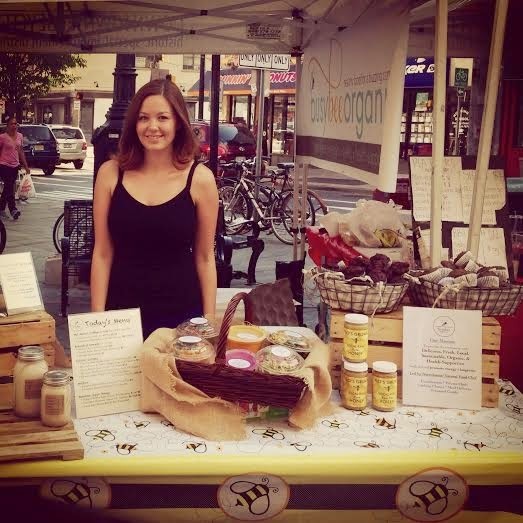 Today's vendor is Oh Honey Apiaries who can be found at various markets around Jersey City Thursday with their local, raw honey. Thanks for participating, Darius and Tine! We are a small treatment-free apiary with locations in JC Heights, Crown Heights (Brooklyn), Union City, and Columbia County, NY. 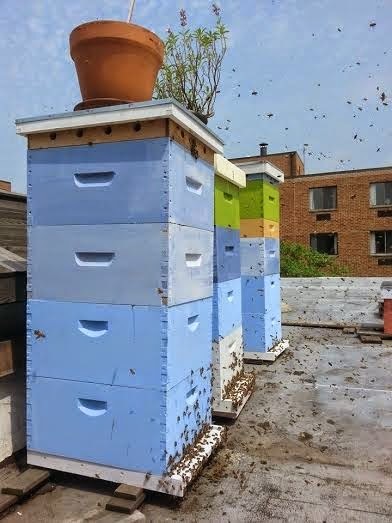 The beekeeper, Darius Plavinskas, started keeping bees on our roof and then expanded his hives to the other locations. 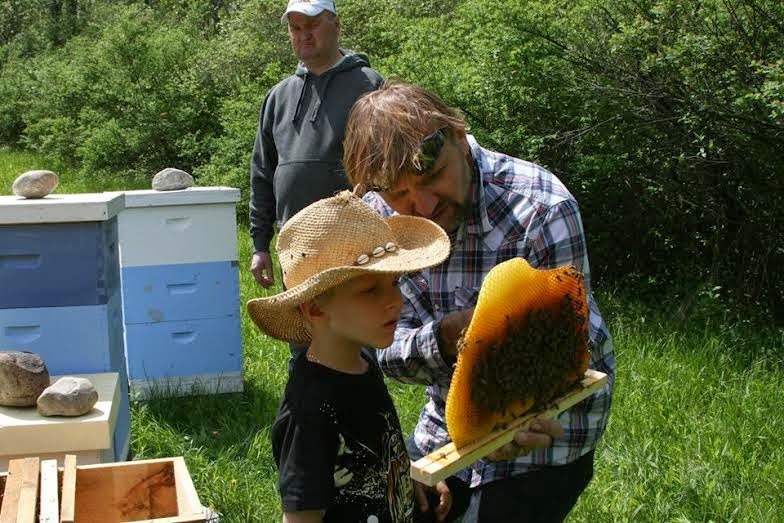 Darius is dedicated to sustainable and organic beekeeping and regularly attends conferences on the best way to maintain his bees without any damage to the environment and the bees. Oh Honey’s products are completely treatment free, which means that we don’t use any chemicals in the honey or on the bees. The honey is extracted cold directly from the comb, which ensures that all the best and most valuable parts of the honey are included and intact (for example, propolis and pollen). There is some evidence that pollen-rich honey is successful in treating seasonal allergies. Propolis, a substance that bees use to protect their hives against pests, has many health-enhancing properties and has been shown to be anti-carcinogenic. In other words: our honey is chock-full of good stuff! Darius is also raising queen bees and creates colonies of resilient and winter-hardy bees. What other markets do you participate in around Jersey City? 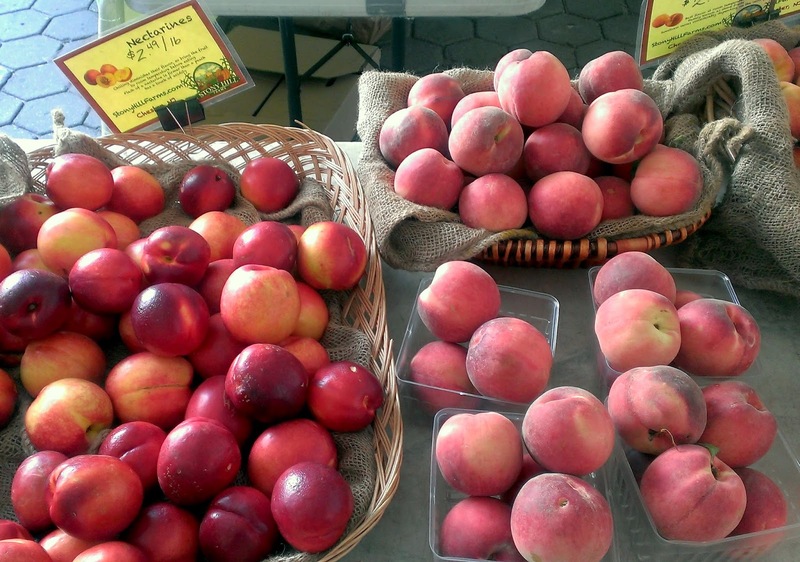 On Sunday mornings, Oh Honey can be found in the Riverview-Fisk Farmers Market. 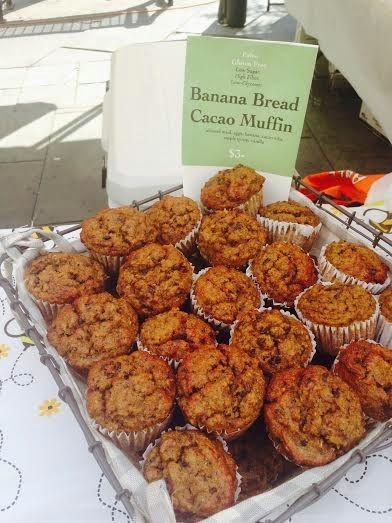 We will also be in the 6th Borough Market on the remaining dates (9/14/2014 and 10/12/2014). 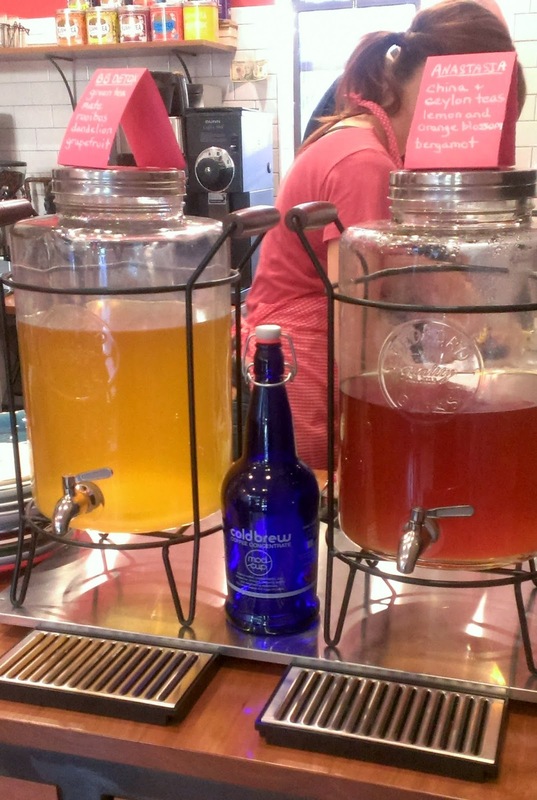 Starting on September 9th 2014, Oh Honey will be in the Historic Downtown Farmers Market by the Grove Street Path on Monday evenings. 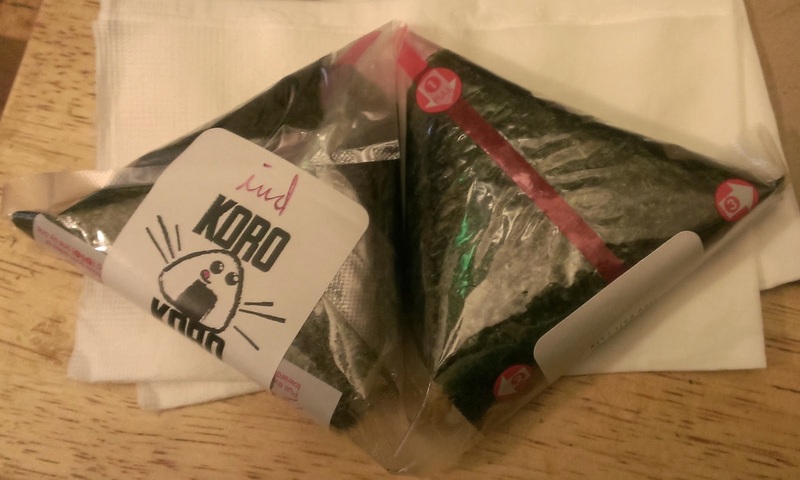 Last week, Koro Koro officially opened for business, serving up onigiri (rice balls) and other Japanese-inspired fare, and it seems like they've had a pretty steady stream of customers since. I stopped by to check it out the other day, and while it's still pretty early on so I won't be doing a full review, I feel confident in saying they're off to a good start. The space is small, but brightly decorated with a couple of tables inside and a couple more outside. While I could see it being cozy when it's empty, if there's a crowd waiting or any sort of line, it gets a bit tight. The menu with rice ball descriptions are hung above the counter, marking which ones are vegan and all of their options can be made with either white or brown rice. For my first order, I decided to get the Indian (chickpeas, carrots, raisins, sweet potato, coconut milk, curry and spices - vegan) and the Cochinita Pibil (pork, habaneros, achiote, cilantro, garlic, lime) as well as an iced Kusmi green tea. Each of the rice balls costs $3.25 before tax and the iced tea was $3. I was worried the size would not justify the price tag, but I feel like it's a pretty satisfactory deal. Because each rice ball is rolled fresh upon ordering, it can be a bit of a wait especially if there's a large order right ahead of you. At this point, service is still running with a few kinks but for only a week in, it's not bad. 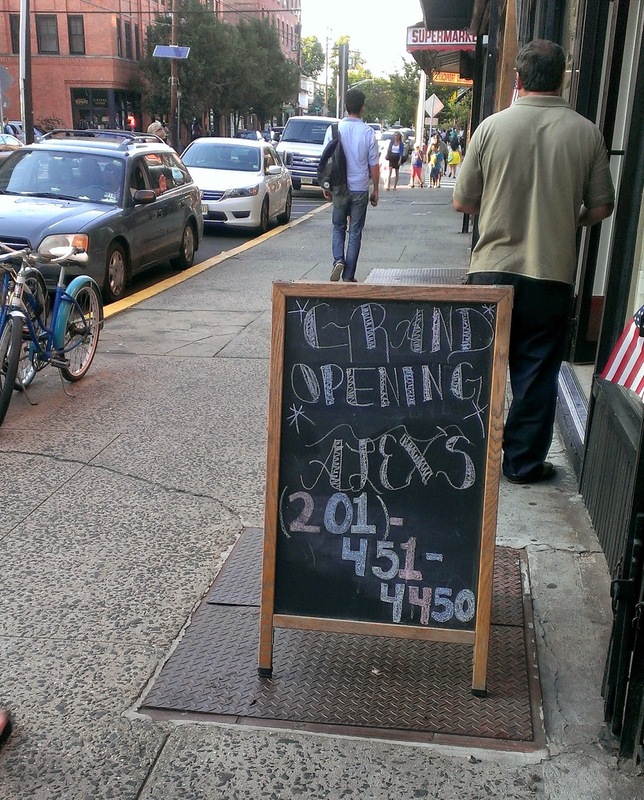 On Monday, Alex's Pizza at 346 Grove Street officially opened. Previously occupied by Sava Polish Diner, the set-up remains fairly similar with orders being taken at a counter in the back and tables in the front. It's pretty spacious and it looks like they are trying to encourage dine-in eating. Roman Nose is closed this week for Staff Summer Holiday Week. They will reopen next week on Tuesday, 8/26. Last week, Cocoa Bakery began selling a special new item: an ice cream sandwich. Their first flavor combination was raspberry ice cream with gingersnap cookies but since then, they've also served up chocolate walnut cookies with vanilla bean ice cream, chocolate cookies with mint chocolate chip ice cream, and raspberry with peanut butter milk chocolate chip cookies. In sad news, Goods & Greens in Hamilton Park announced this weekend that they will be closing up this week. As of now, they're anticipating closing by Thursday, August 21st. As of now, there are no specific plans for the space. 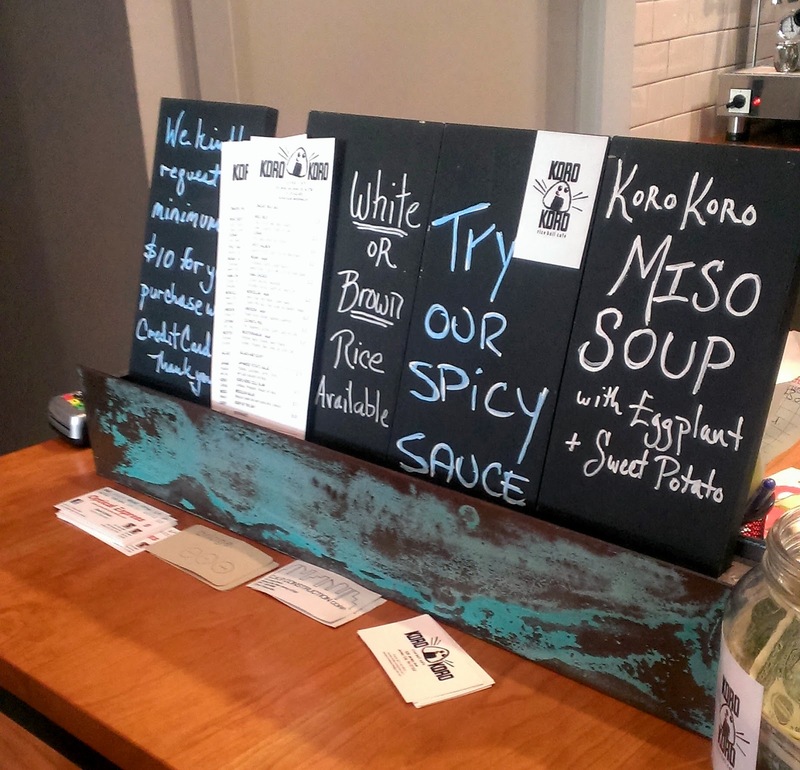 Koro Koro officially opened their doors last week for their soft opening! They will be open from 11am-9pm every Mon-Sat. Nu Bar has a new brunch deal: $10 gets you bottomless brunch cocktails served along with their delicious-sounding menu. The Dark Side of The Moo has expanded beyond exotic meats and started serving Jersey City Veggie Burger's Three Sisters Burger. Congratulations to Third & Vine on celebrating their six month anniversary last week! If you're looking for something to do this weekend, Jersey City has plenty to offer! La Festa Italiana continues through the weekend, running every night from 5pm-11pm with food, drinks, live entertainment and much more! 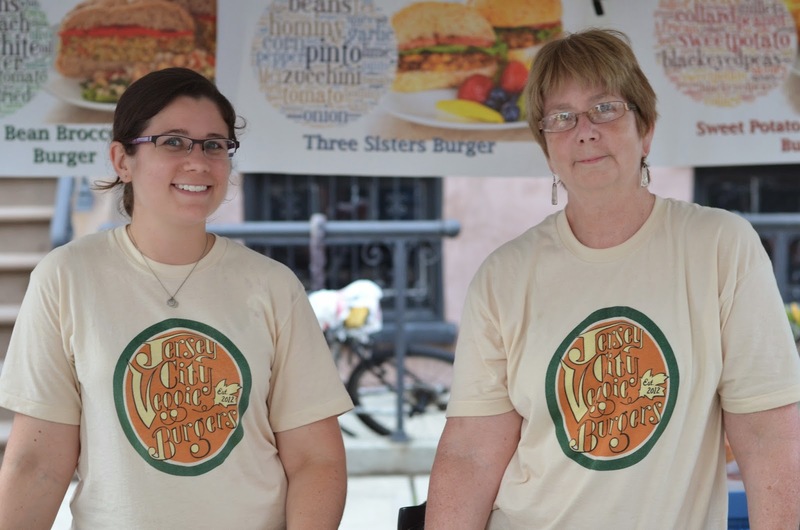 Zeppelin Hall is holding their Summer Bacon Festival. Not for vegetarians or the sodium-sensitive, they're serving up 14 specialty bacon dishes including two bacon desserts. This event is going on now and will run all the way through to August 24th. We're starting off with Michelle Berckes of Busy Bee Organics who can be found at Grove Street every Thursday with delicious and nutritious options. Thanks for participating, Michelle! Hi, I am Michelle Berckes, Nutritionist and Certified Natural Food Chef and Owner of Busy Bee Organics, LLC. I am a Jersey City resident, preparing health-supportive cuisine for the JC community. I have been visiting JC for many years as my sister and brother-in-law, Meika and Warren (owners of Another Man’s Treasure) have been here over 10 years. Always feeling a strong connection to JC, I decided to move here this past September and I was surprised that although there are a lot of fantastic eateries here, there is a lack of delicious, healthy food spots. That's when I decided to take action. I started Busy Bee Organics in May 2014 to provide quick, healthy food that tastes great and makes you feel great. Healthy food has a stigma attached - often comparing the word healthy to “bland or cardboard-like.” At Busy Bee, we’re doing it a little differently. You will NOT find fat-free, artificially sweetened foods at my stand. Here you will find foods made with real, whole foods, local organic crops, high-integrity ingredients, and with a focus on low sugar/ high protein. Nothing we make is chemically processed and we try to be very allergy friendly (95% of what we make is gluten and dairy free and we write down the allergens on our labels). 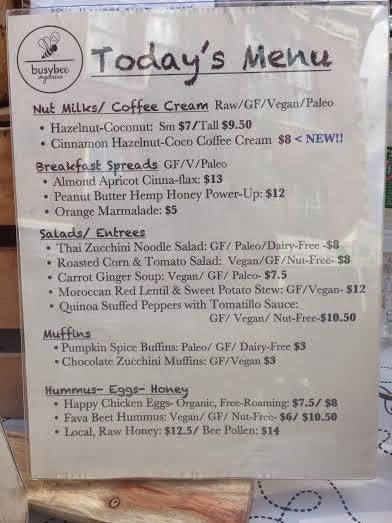 You can come by our booth on Thursdays and easily find nutrient dense and flavorful entrees such as our Coconut Thai Curry, baked goods like our signature “Buffins,” unique salads, soups, nut milks, and complete nutrition breakfast spreads in addition to our unprocessed raw honey and much more! So far we are happy at the Grove Street Market. This is my first season doing the markets and I love it! We are looking into a few others but for now we can be found at Grove Street on Thursdays 4-8pm. 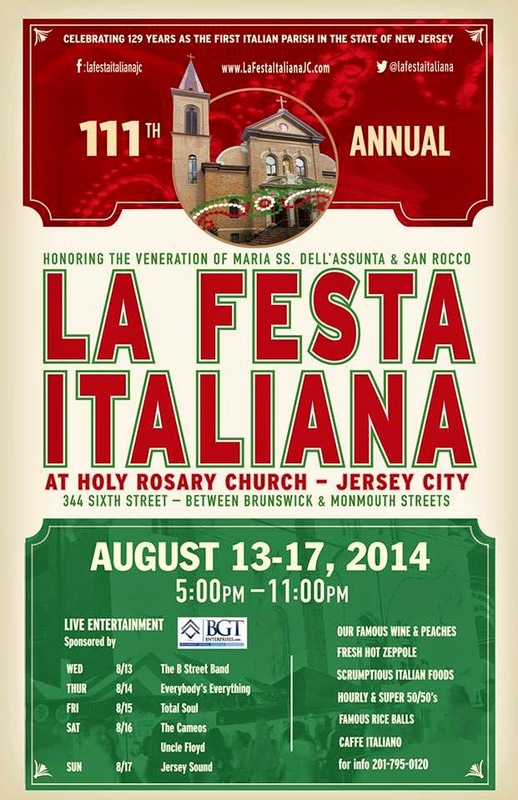 Today, Wednesday 8/13, marks the beginning of La Festa Italiana in Jersey City! Held on 6th Street between Division and Monmouth Streets, this wildly popular annual Old World Italian Festival runs from Wednesday through Sunday from 5pm-11pm. Park & Sixth Gastropub has decided to make your Tuesdays better with a new Burger & Beer Special starting tonight! 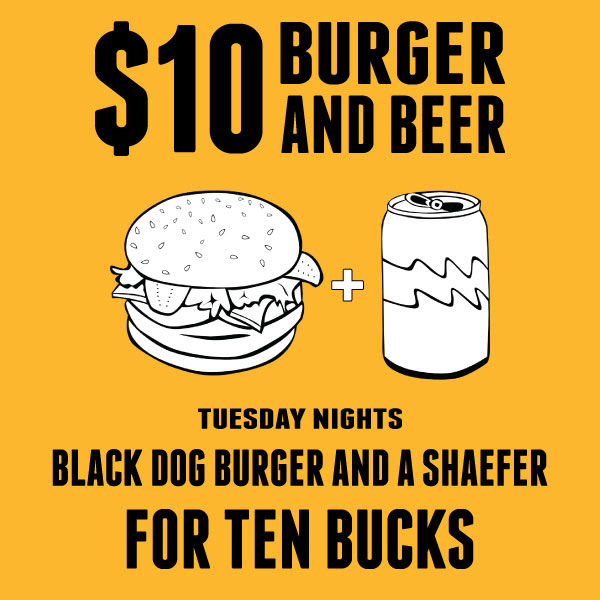 The special includes a Black Dog Burger and a Schaeffer beer for $10. In case you've missed it, over the past couple of days, there have been some great articles written about Jersey City and in particular, the food scene in Jersey City. The Hudson Reporter discusses well-known restaurants in Jersey City, both old and new, and mentions the neighborhoods and influences drawing in new people, talent, and chefs. Congratulations to Milk Sugar Love on being featured in the New York Times this weekend! If you want to know what flavors you can get at Milk Sugar Love, check the website where the daily flavor list will be posted. This Wednesday marks the beginning of La Festa Italiana! This past Sunday, I was a judge in the 2014 Perfect Peach Pie Contest at Riverview Farmers' Market . It was a great time and I was really grateful to be able to participate, taste all the pies, and enjoy the Riverview Farmers' Market. Congratulations to Barcade, Sam a.m., Maritime Parc, Torico, Taqueria Downtown, and Razza for being included among the winnders in NJ Monthly's Jersey Choice Restaurant Poll 2014. All of them were also marked as critic's picks. 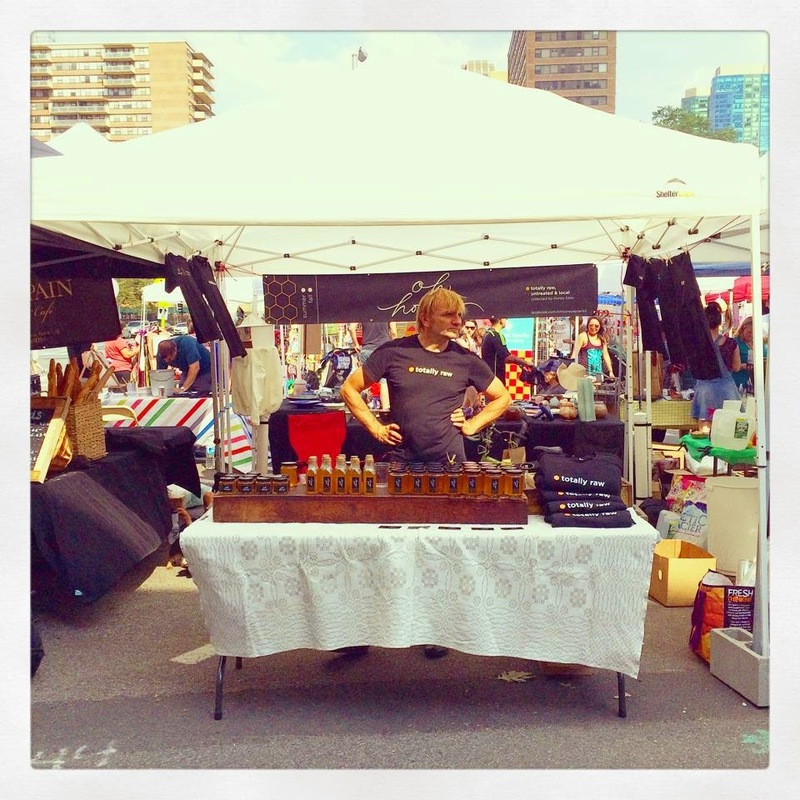 Next Sunday, August 10th, is the next installment of the 6th Borough Market! Check out this feature on Sam a.m. from The Jersey Journal's Meet the Merchant. Today marks the beginning of Chili Mania at Zeppelin Hall! From today, 8/1 through Sunday, 8/10, Zeppelin Hall will be serving thirteen different kinds of chili including a vegetarian option and a tasting platter. Also in new and exciting menus, join Park & Sixth Gastropub this weekend as they introduce their new brunch menu.